The main charity that we support is "Christel House" founded by Christel De Haan the former owner of RCI. 'Christel House' provides schooling and education for children in deprived parts of the world. As part of their fund-raising, a Golf tournament is held each year at several courses around the globe. In the UK it is held at Badgemoor Golf Club, Henley-on-Thames. Club Olympus provide a team each year and always have a great time. Our team this year is pictured below with a couple of England Rugby Internationals who attended the event. 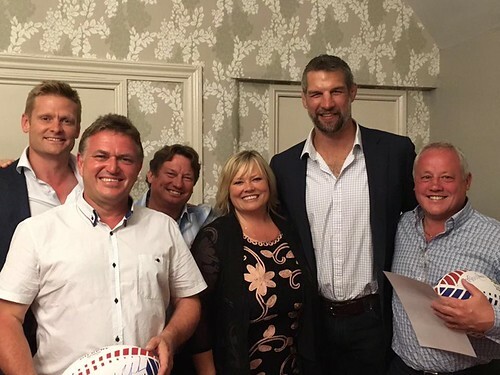 From left to right we have:- Iain Balshaw MBE (Leeds, Gloucester, Biaritz, England), Jono Darnbrook, Peter (Sedge) Rhodes, Jodie Darnbrook (nee Rhodes), Simon Shaw (Wasps, Toulon and England) and finally Tony Rhodes. A great deal of money was raised for charity and the guys had a brilliant time.